Bob and I want to thank you for the work you did on our retaining wall. It looks beautiful and fits so well into the back of the driveway...We will definitely recommend Earthworks Constructors to anyone who inquires about a good reliable contractor. Thanks so much for our beautiful walkway. The salvaged granite stepping stones are exactly what we had dreamed of and the installation was quick and thorough. It is the perfect compliment to our historic shingle style summer cottage. 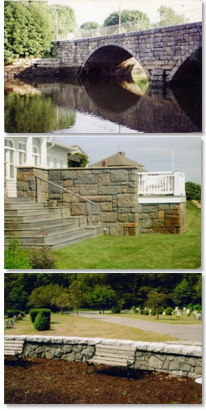 Earthworks Constructors Inc has been offering preservation and restoration services and landscape design and construction to the Gloucester and Rockport, Massachusetts communities since 1980. We specialize in the preservation and restoration of historic sites and structures. We bring a sense of creativity and professionalism to all of our jobs to ensure that your home or site is as beautiful and functional as possible. With over 30 years of experience and an outstanding reputation for quality and professionalism, our goal has been to ensure the complete satisfaction of every client. For years, we have expertly serviced our customers with a consistent level of performance that is rivaled by none. We take great pride in our reputation and maintain the utmost in quality and customer service in all aspects of our company. Our philosophy is to build lasting relationships with our customers. what we have to offer you. If you have any questions or comments, please feel free to contact us. We look forward to hearing from you! Copyright , All Rights Reserved, Earthworks Constructors, Inc.